"Amethyst Vintage sounds awesome. Really amazing on cello." Bobby TahouriComposer. It is almost impossible to picture today's pro audio and recording industry without technological innovations introduced by Violet™ microphones. For end users, Violet's vast experience in microphone technologies coupled with graceful designs adds up to unprecedented quality. 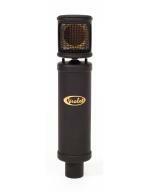 All Violet Design microphones are hand made in Latvia. Violet Design was founded in 2003 to facilitate the manufacturing and worldwide distribution of Violet™ and Flamingo™ branded microphones.